Although I'm not a vegetarian, far from it, I have always enjoyed meatless meals. 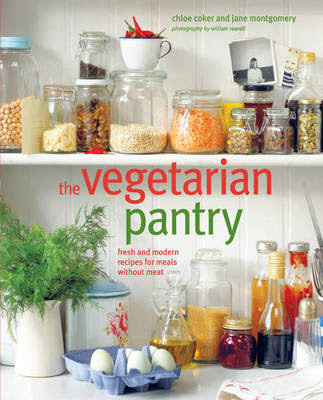 The Vegetarian Pantry by Chloe Coker and Jane Montgomery aims to teach you how to create stunning dishes using the best of fresh produce and a well stocked kitchen pantry. I have a number recipes bookmarked already. Chloe Coker grew up in a vegetarian household and is passionate about encouraging people to cook with and enjoy local, seasonal food. Previously a lawyer in the city, she turned her passion into a profession and retrained as a chef at Leiths School of Food and Wine. Jane Montgomery had a previous career in advertising but turned her creative flair to her love of food and trained with Chloe at Leiths School of Food and Wine. Since then she has spent time cheffing and cooking for private clients as well as teaching classes. In 2010 Chloe and Jane launched Citycook, www.citycook.co.uk a boutique teaching and catering company specialising in bespoke events. The introduction tells you a bit about Chloe and Jane and their inspiration for writing the book. This is followed by some sound advice on staying healthy as a vegetarian with details of key nutrients required and how to get them in a vegetarian diet. The authors also, helpfully, describe the requirements for a well-stocked vegetarian pantry and how to store your ingredients. Breakfast and Brunch includes Quick Cornbread, Saffron and Pepper Frittata with roasted garlic aioli, which would make a great lunch or even main meal, as would Herby Chickpea Pancakes with Halloumi and roasted corn and red pepper salsa. For the sweeter toothed breakfaster how about French Toast stuffed with bananas or Honey and Apricot breakfast muffins? Small Bites is a chapter of snack, starters, tapas or mezze ideal if you like to entertain. Choose from Lemon and Mushroom risotto balls, Vegetable Dumplings with dipping sauce or indulge in Samosas with lemon and garlic dip. There are some great buschetta toppings and one recipe I've particularly bookmarked: Breadcrumbed Halloumi goujons! Dips, Salsas and Sauces provides some recipes to help your vegetarian dishes along. I liked the look of Sweet Potato hummus with breadsticks, there are four punchy pesos: roasted beetroot pesto, watercress pesto, mushroom and walnut pesto and a ricotta and herb pesto. The three fresh salsas look great too: apple, celery and mint salsa, Carrot, orange and mint salsa and Asian cucumber salsa. The chapter is rounded off with a Spicy Tomato Ketchup and a Sweet Chilli Jam recipe. Soups and Salads promises us light refreshing summer dishes and warming winter comfort food. There are both hot and cold soups and some interesting salads including Beetroot Quinoa and green bean salad with spicy ginger dressing and shallot crisps, I bookmarked the Winter salad of pearl barley, mushrooms and walnuts as I love the nutty taste of pearl barley. There is also an Italian tear and share bread and a Soda Bread recipe to accompany your soup or salad. And so we move on to Main Dishes, possibly the most visually appealing is the Carrot and Leek Tarte Tatin with the caramelised vegetables atop a layer of light puff pastry. The Beetroot Risotto is a glorious deep pink and the Individual Baked Cheesecakes with salted honey walnuts are worthy of a special dinner party. I have to say I found this chapter the weakest in the book, there are a number of one-pot dishes which look rather uninspired alongside the delicious ones I have mentioned. We all love Sweet Treats and there are some real crackers in this chapter. Always on the lookout for rhubarb recipes, I will be trying the Rhubarb, Orange and Vanilla Fool with shortbread cookies. Plum Frangipane Tart with ginger cream also sounds good and, as a sucker for all things almondy, Poached Amaretto Peaches with Amaretti cookie creme fraiche is on my list for the summer. There are few baked sweet treats too including Orange, almond drizzle cake, Chocolate Orange Brownies and Pistachio, white chocolate and Cranberry Biscotti. This is a book for an established vegetarian who is looking for some inspiration and new ideas particularly for entertaining. It would also appeal to adventurous non-vegetarians with good cooking skills who would like to try something different. The book is well laid out with large clear photographs to tempt you to try the recipes. The recipes themselves are well written and easy to follow with symbols indicating where they are suitable for vegans and those recipes which are gluten-free which I thought was an excellent idea. I felt that the recipes were aimed at summer eating and most of the recipes that are "comfort food" were a little predictable and would already be in the repertoire of most vegetarians. Nor do I think this is the best book for new vegetarians as it features a lot of bits and pieces rather than main meals. 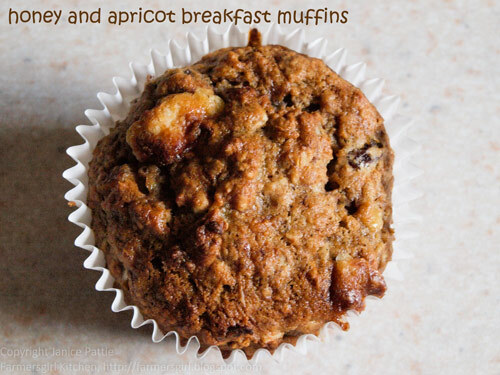 As my featured recipe, I chose to make these Honey and Apricot Breakfast Muffins which are easy to make and incredibly soft, moist and delicious. They also kept very well in an airtight cake tin which is a bonus. Sift the flour into a mixing bowl. Add the bicarbonate of soda, baking powder and mixed spice and stir to combine. Add the dried apricots, pecans and oats to the flour mixture together with the sultanas and set aside. In a separate bowl, mash the bananas with a fork. Add the apples, eggs, oil, vanilla extract, honey and milk and stir to combine. Add the sugar and stir gain. Make a well in the centre of the dry ingredients. Pour int he wet ingredients and gently stir from the centre, gradually drawing in the dry ingredients to make a smooth batter. Fill the muffin cases two thirds full and top with chopped pecans for added texture. Bake in the top half of the preheated oven for approximately 30-40 minutes until the muffins are well risen, golden and springy to touch. Remove from the oven and cool on a wire rack then serve with cups of hot coffee. 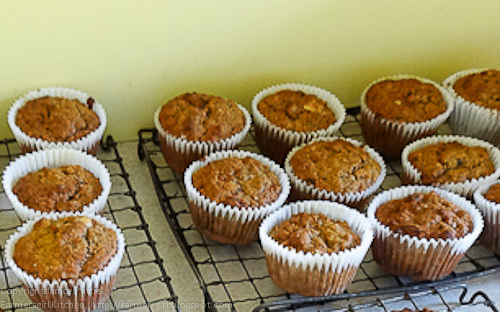 These muffins are best eaten fresh but will keep in an airtight container for 3 or 4 days. 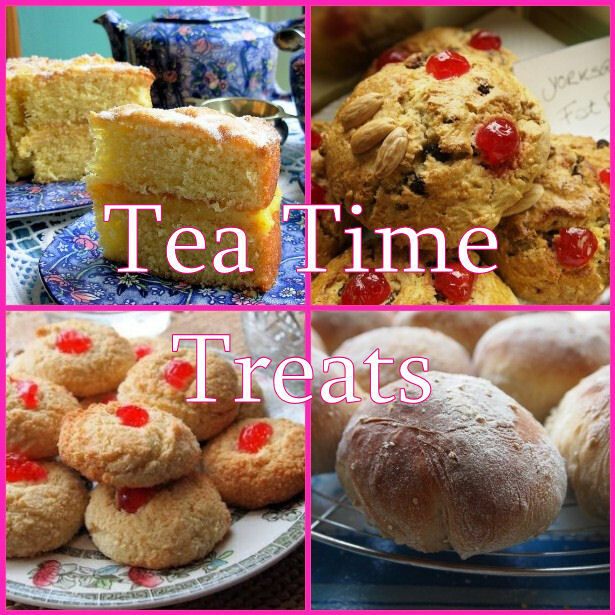 I'm entering these moist, fruity and delicious muffins for Tea Time Treats. The Tea Time challenge hosted by Karen at Lavender and Lovage and Kate at What Kate Baked. Kate is hosting this month and the theme is "Fairy Cakes, Cup Cakes and Muffins". I received The Vegetarian Pantry to review, I was not paid for my review and all opinions are my own. Sounds good - I think things have moved on since the Bean Book, which is what I grew up on.